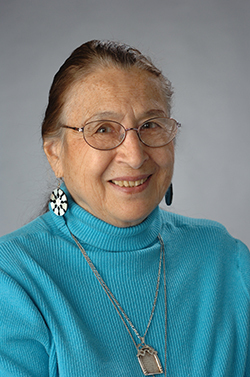 In honor of her dedication and service to Syracuse University and its students for more than 40 years as an educator, researcher, scholar, mentor and friend, the Falk College announced the establishment of the Dr. Alice Sterling Honig Endowed Scholarship Fund to benefit students majoring in child and family studies at Syracuse University. The endowed scholarship was created in her honor through a generous gift by long-time colleague and retired Syracuse University faculty member Bettye Caldwell. Honig and Caldwell met at Syracuse University in the Department of Child and Family Studies in 1963 when Caldwell hired Honig as a research assistant for the grant “Infant Learning and Patterns of Family Care.” The two remained colleagues, collaborators and friends since that time. “In those 51 years since Alice got her first job in Syracuse, she has become one of the most productive and most respected people in the field of early child development. She has published hundreds of articles and books. Within the University, she has supervised the work of many students,” says Caldwell. A licensed psychologist and a fellow of both the American Psychological Association and the Society for Research in Child Development, Honig has done extensive research on infants and toddlers, language development, child-care practices, preschooler social development, fathering and the effects of divorce on children. Honig presents training sessions and delivers keynote addresses to promote high quality childcare all over the United States and in several other countries, including South Korea, Singapore, France, China, and Australia. For over a decade, Honig (with a lawyer as co-leader) conducted workshops for the Onondaga County Mental Health Association for parents with divorce and child custody issues. She contributed regularly as a columnist for “Scholastic Parent and Child” and “Scholastic Early Education today” as well as for the Scholastic Website for parents. For over 20 years, Honig has been the North American editor for the British journal “Early Child Development and Care” and on the board of the National Head Start NHSA Dialog Journal. She has been on the editorial board of Child Development, the official journal of the Society for Research in Child Development. She is also a member of the Editorial board of PsycCRITIQUES. “I know of no one more deserving than Dr. Alice Honig to have an endowed scholarship named for her, and I am very happy to see that this is happening,” concludes Caldwell. To donate to the Honig Endowed Scholarship Fund, contact David Salanger, assistant dean for advancement and external affairs in the Falk College, 315-443-4588 or dasalang@syr.edu. Bettye Caldwell works with a child. In the 1960s, Caldwell’s work in the area of comprehensive early childhood development programming primarily serving low-income preschool-age children and their families at the Children’s Center of Syracuse provided the foundation for what became one of the most important components of the Great Society programs launched by President Lyndon B. Johnson known today as Head Start. 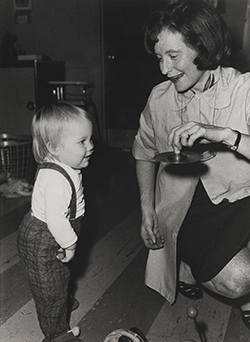 In addition to her role as a faculty member in the Department of Child and Family Studies more than 50 years ago, Caldwell worked closely with Julius Richmond, then-chairman of pediatrics at Upstate University Hospital with whom she worked on the infant learning grant, along with Honig. In 1967, she formed the Children’s Center with Richmond, who eventually became surgeon general and went on to serve as national director of Head Start for President Lyndon Johnson. The work she and Richmond did in Syracuse as cofounders of that childhood learning initiative provided the foundation for the national Head Start program.